Fun, pretty, happy image...the flowers on her hat are pretty. 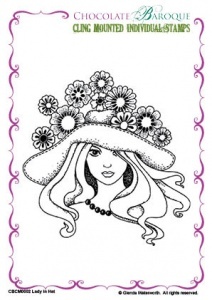 Lady in hat cling stamp. This is a fantastic image so useful for many occasions birthdays, get well thank you ect. The stamped image is crisp and clear can be used with many backings I already have and crealies flowers to accent. Thankyou chocolate baroque for a wonderful stamp! This is a beautiful good sized stamp that is perfect for birthdays, thank yous, get wells - even Easter cards etc. I am very happy with my purchase and I know it will be a much used favourite! Lovely stamp- have enjoyed colouring it-especially in muted brown tones and it was so good to have it ready mounted. It arrived in very good time especially over Christmas period. This is a well cut stamp enabling me to miss out some of the flowers with ink and make a smaller hat. Lovely face and colouring the hair was a joy!